Everything Is Better With. . . 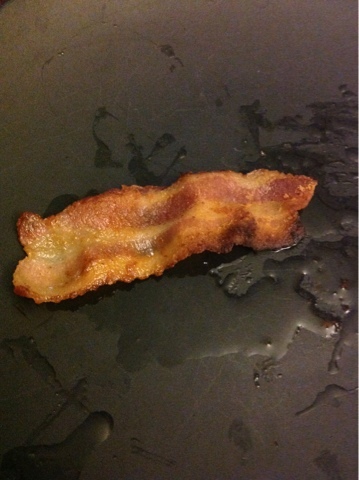 The last piece of bacon. Yes that is grease it is sitting in. It is 9:53 on Saturday morning and because I have a two year-old I have been up since 7:00. This has given me time to build multiple forts, have two cups of coffee, serve up a plate of fruit for the boy and a plate of bacon for me. There is something that screams, “This is proof of a higher power” when you bite into a slice of thick cut maple bacon. Ahhhhhh. Now my day can begin. Go forth and eat pig meat the way the good Lord intended.